The Parts Alliance has announced a new national garage promotion to run throughout February and March. The ‘Original Experience’ will see The Parts Alliance collaborate with leading suppliers Delphi, Comma, MANN-FILTER and NGK. 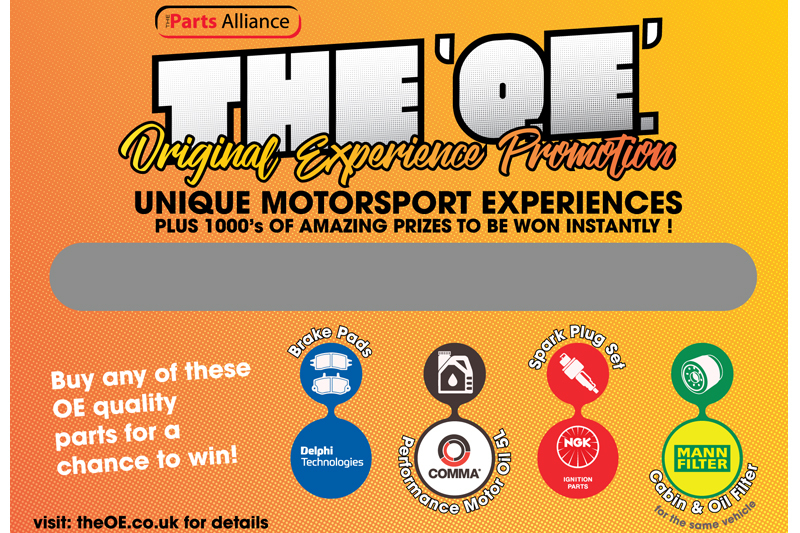 During the promotion period an ‘Original Experience’ scratch card will be given to garages with all purchases of qualifying OE quality products. These include Delphi brake pads, MANN-FILTER cabin and oil filters for the same vehicle, Comma five litre Performance Motor Oil as well as sets of NGK spark plugs. As top prizes, the instant win scratch cards offer four unique motoring experiences. Winning garages will gain luxury VIP trips, going respectively to the Rally Italia Sardegna, the Ferrari factory in Maranello and the GT Series in Germany. Closer to home, there’s the chance to drive six cars flat out around Bedford Autodrome during a renowned PalmerSport day. The Parts Alliance say the promotion not only demonstrates their commitment to stocking and supplying leading brands but also highlights an important message in urging garages to use quality products to ensure motorists gain the ‘original experience’ from their local independent. “The beauty of this promotion is, garages only need to source what they’ll be buying anyway for day to day braking and service work to win” said Simon. In total, there are 65,000 prizes including snack boxes, t-shirts, beanie hats, wall clocks, mugs, workwear socks, playing cards and bottle openers to be won before the end of March. The ‘Original Experience’ is running nationwide at branches of Allparts, Bromsgrove Motor Factors, BBC Superfactors, BMS Superfactors, Car Parts & Accessories, CES, Dingbro, GMF Motor Factors, GSF Car Parts, SAS Autoparts, SC Motor Factors, The Parts Alliance (South West) and Waterloo Motor Trade. For more information, click here, or contact your nearest participating branch.